Here’s everything you need to know about selecting, installing, and maintaining this summertime essential. Breezes in, bugs out—functionally speaking, the screen door hasn’t changed much in the past hundred years or so. Different types, however, and their varying price points have emerged in more recent times. If you’re in the market for one to separate your indoor and outdoor spaces, read this before you shop. You’ll find all the guidance needed for selecting and installing a screen door that’s ideal for your house and budget. 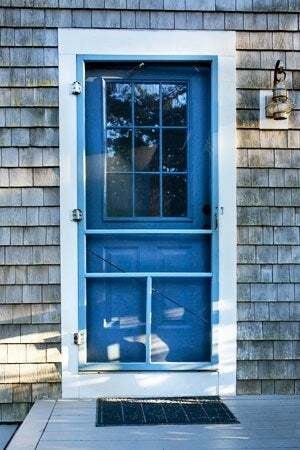 Screen doors are different from storm doors, though the terms are often erroneously used interchangeably. Storm doors, as the name implies, are designed as barriers against inclement weather. Though their frames are rugged (made of steel, vinyl, or aluminum), they may have a screen along with a sliding glass panel to let air pass through at your discretion. Standard screen doors, however, aren’t intended for heavy duty. If you’re looking for protection against the elements, opt for a specialized storm door. Three varieties of screen doors exist to supplement the myriad of home entrances. 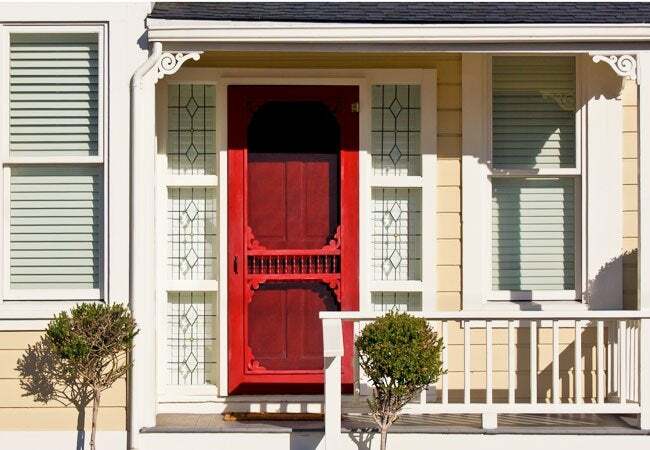 • Perhaps the most familiar style, one known to go hand-in-hand with a picturesque front porch, the traditional type fits in the outer portion of an exterior doorjamb and opens outwards. Purely functional, bare-bones models are suited to side or backyard entries, yet you can certainly find a stylish one to complement a front door. These traditional screen doors come in standard sizes and are typically made of wood, although aluminum and vinyl versions are available. • Some homeowners prefer a retractable screen for a front door. Based on the principle of pull-down window blinds, the retractable screen is stored in a spring-loaded casing, positioned either at the side or at the top of the doorframe. You pull it across or down when you want to leave a door open to get a breeze and block bugs. It’s appealing for a front entrance, since it’s all but invisible and won’t interfere with curb appeal. • Finally, there are slider screen doors that install on the exterior track of a sliding patio door. While some patio doors do come with sliding screens, you can find add-on options for an existing sliding door. You can find a traditional screen door made of unfinished pine for around $30, while low-end vinyl and aluminum models start at around $50. If you’re looking for stainable hardwood or an ornate design, the cost could go as high as $200. Retractable screens start at around $30 but these cheaper models don’t offer sidetracks, leading you to potentially deal with gaps at the edges. High-end models, running $500 or more, have a variety of bells and whistles, including secure tracks, motorized remote-control operation, and double-door protection for French doors. Sliding screen panels for patio doors start around $40 and come in standard sizes, but not all sliding doors accept generic screens. Check with the manufacturer of your patio door to determine if you need to order a custom screen, which could run upwards of $100. Screen doors come in standard sizes. For a traditional screen door, measure the door you’ll be pairing it with and purchase a screen door in a matching size. If you have an off-size door, consider purchasing the next size larger wooden model and cutting it to fit. Most, but not all, retractable screens require measuring the inside of the doorjamb. Read manufacturer’s measuring instructions (usually posted on the outside of the box) to be sure. For a sliding patio door, measure the door panel that slides and purchase a corresponding screen panel. Most traditional screen doors are universal, meaning you can install them to open on the either the right or the left, depending on your preference. The spring that holds the door closed installs midway on the door, typically behind the push bar, on hooks, so you can remove it when you want to open the door all the way. Retractable screen installation differs by type and brand, so follow the manufacturer’s instructions. Typically, you’ll use the same tools needed for traditional screen door installation, but if you’re attaching a bottom track to a concrete or brick porch, you’ll also need a masonry bit and concrete screws. Some higher-end retractable screens do require professional installation. Last but not least, installing a screen door that slides is all about track placement: Position the door in the exterior track and lift it up to hook the rollers in the upper track runner. When it’s in the right spot, it should slide smoothly. Most wooden screen doors come painted, but often the top and bottom edges are raw wood. Sealing the raw edges with exterior paint that matches the door before installation will prevent premature weathering. 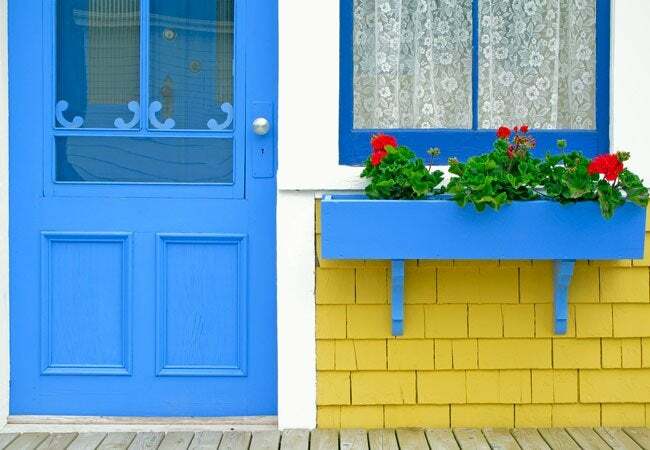 If you purchase an unfinished door, paint the whole thing with quality exterior paint, or stain it and brush or spray on a coat of spar varnish to keep it looking new. Vinyl and aluminum screen doors require no additional weatherproofing. If the bottom of the screen door has a large gap, consider installing a door sweep. Available at most any hardware store, this add-on attaches to the bottom of the door to keep out dust and crawly bugs. After installation, enjoy the easy, breezy nature of your new screen door—and don’t let it hit you on your way out!